Operation Christmas Child, a Franklin Graham Ministry, sends shoeboxes packed with toys and hygiene items to needy children around the world. It is a tangible way to share God’s love with children who have little. A packing party is a unique opportunity for family, friends, colleagues and neighbors to come together and experience the great joy of Operation Christmas Child. 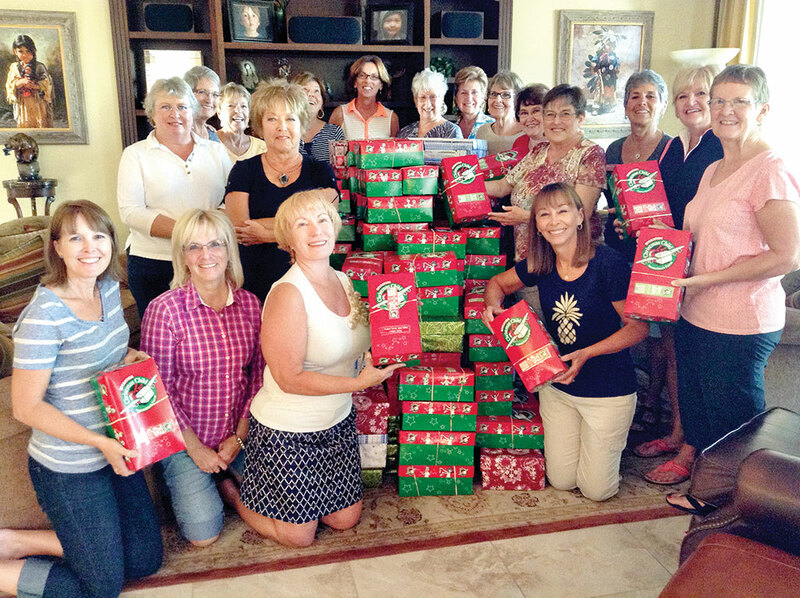 The women of Robson Ranch gathered together at the home of Bev Douglas for a packing party. Thanks to the generosity of these ladies, over 160 boxes were packed this year: a record for our community! A very special thank you to Nordstrom Last Chance for their contribution of backpacks and socks, the Comfort Inn for hundreds of bars of soap, and Dr. Jones at Promenade Smiles for a donation of 200 tooth brushes and tooth paste. Many needy children will be touched this year by these boxes of joy. Thank you to all who participated in this worthwhile cause.